Bargain hunting after four straight declines allowed the shared currency to rebound by 22 points against the dollar to $1.3552. The move was undoubtedly aided by US economic data which missed the mark and raised questions over whether the slowdown might convince the Federal Reserve to hold interest rates at record low levels for longer. The euro/dollar FX pair continued to fall yesterday, losing another 15 points to $1.3531, a level last seen in early February. The current declines in the single currency are being fuelled by speculation over Mario Draghi's hints about more radical ECB measures after they cut interest rates in an attempt to spur growth and address falling inflation. True to its recent bearish form, the shared currency resumed its downward trajectory against the dollar, losing another 46 points to end at $1.3546. An ECB official reiterated 'the determination for keeping high monetary accommodation', with many expecting additional measures to weaken the euro. Eurozone investor confidence plunged by more than expected yesterday, pushing the shared currency down amid reduced volumes due to the bank holiday in a number of countries including Germany and France. At the same time, speculation grew that last week's decision by the ECB could send investors out of the euro and into higher yielding currencies/assets. 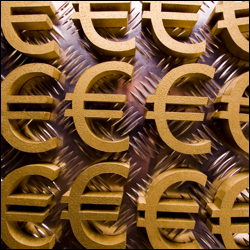 The EUR/USD pair ended 49 points down at $1.3593. Whilst the ECB may have cut deposit rates to -0.1% on Thursday and Mario Draghi did reaffirm his willingness to act again if necessary, the forex market did not really seem convinced. After posting a rebound a day earlier, the shared currency resumed its slump against the dollar on Friday, with the EUR/USD pair ending 18 points lower at $1.3644. In addition, an optimistic outlook for the US economy boosted demand for the dollar following the release of the latest NFP figure, further weighing on the euro.